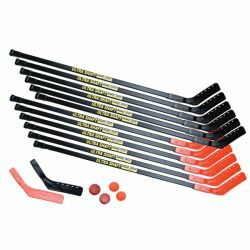 The Champion Sports Ultra Shaft Hockey Set features the strongest, toughest hockey stick for serious players. The superior polyethylene shaft is designed with dual I-beams running the entire length, and a center fiberglass dowel provides extra strength. The high density blades are reinforced with fiberglass as well for strength and stability. 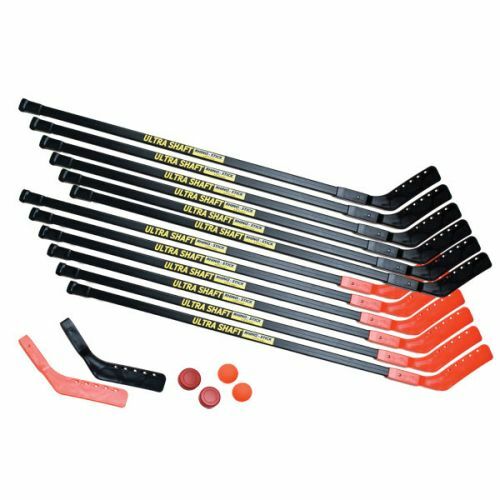 This twelve player set includes twelve 52" sticks, two pucks, two no-bounce balls, and two extra replacement blades.